I had a great day a couple weeks ago scoping sites on the Jornada Experimental Range. John Anderson, the site manager for the Jornada, gave us the grand tour of areas that had good biocrusts and areas that had some of the plants that we considered targeting. We had great weather and were really able to benefit from his expert knowledge of all of the plants and all of the experiments that have been set up there over the years. It’s a wonderful site to have near us at UTEP. The picture above shows Eva wetting up some crusts to see what they do! 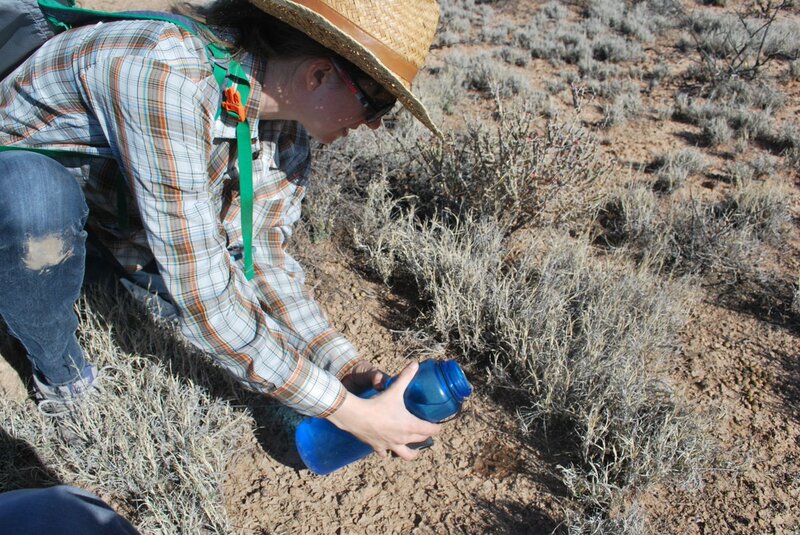 One interesting thing we learned is that there has been a recent convergence of interest in biocrusts at the Jornada, with now three big projects, one focused on biocrust restoration, one focused on examining biocrust effects on soil stability, and our study of translocation between biocrusts and plants. We are hoping to be able to share insights and findings with these groups and gain an unprecedented look at the role of this component of the Jornada site.